When the first batch of hosts for this season of Saturday Night Live was announced, everybody circled this date on their calendar as it marked the first hosting gig for SNL alum Tracy Morgan. It was much bigger than that though. It also was his first working appearance since a car crash last year that almost took his life. This was to be the triumphal return of one of the show's most beloved characters. It didn't disappoint. The show started with what could turn out to be the best sketch of the season. The Democratic Debate was the topic of the day, which always has the potential to be a highlight thanks to Kate McKinnon's Hilary Clinton. What made this sketch so good is who filled out the rest of the panel. Alec Baldwin portrayed the overly-confident and annoyed Jim Webb, and in what may be the best casting decision the show has had (at least since Tina Fey became Sarah Palin), Larry David was brought in to play Bernie Sanders. It was perfect. All of a sudden, McKinnon's Clinton was the boring sidekick, which many think is the case in the real campaign. Either way, this made for a classic sketch that will be replayed for years to come. Now the moment everyone was waiting for. Tracy Morgan took the stage. There was a group of people who really wanted to welcome him back in a special way. So they recreated a scene in 30 Rock, complete with Alec Baldwin, Tina Fey, Jack McBrayer, and Jane Krakowski. It was a great way to welcome back Morgan and start the show off as the celebration it was meant to be. Colin and Michael had their first hiccup this week. When you work in comedy, every now and then a joke won't work. However, these two had a bit that flamed out so impressively that it left the hosts chuckling to themselves, which is funny because they were the only ones laughing. As far as the guests to the Update desk go, you can't pass up an opportunity to have Tina Fey visit when she is in the building. The second guest was Michael's neighbor Willy, who gets better and better each time he shows up. I have two best sketches to showcase here. First is an old classic Tracy Morgan sketch everyone knew would be coming back, but everybody was excited to see. Brian Fellow's Safari Planet is possibly Tracy's most beloved sketch, and to see it back brought a collective smile to SNL fans everywhere. The other best sketch brought a new definition to Family Feud as the two families competing had recently separated. Every sketch in this episode had its moments. Tracy Morgan has a tendency to do that. However, this sketch was just a little too weird. It was like the start to a classic Broadway musical, as everyone sings their good mornings to each other. However, it starts to go very wrong as someone doesn't quite get it. It's funny, but just a little too much. Again, here are two sketches; one from Tracy's past and one new one. Astronaut Jones was the epitome of a Dark Horse Sketch, as it was just weird enough to be original and hilarious. The other sketch seeks the answer to a very simple question, "Where is Jackie Chan at right now?" As I said, this episode was more of a celebration that Tracy Morgan is back and ready to make us laugh again. He definitely did that in this episode as he brought back some highlights of the past and found new ways also. It is episodes like this that make you sad certain cast members had to move on. The only thing that would have made this episode better would have been a Christmas song brought to us by Tracy, Jimmy Fallon, Chris Kattan, and Horatio Sans. Oh well, maybe next time. College football doesn’t get more exciting than that Michigan-Michigan State game. The absolutely shocking, absurd, and amazing ending had Jim Harbaugh almost weeping in his khakis. This week also showed us that a team is capable of turning the ball over 7 times in the first half. Way to go Boise. Oh, and Baylor was held to just 62 points. Just another week in college football! 25 (20). Mississippi (5-2) – Everyone made their loss out to be some big upset, but they were playing on the road in the non-conference in the middle of the season against a borderline elite offense. They were going to lose, and they lost their best player to an injury because they decided to keep playing their DT at RB with a 2 touchdown lead. This team can’t get out of its own way. 24 (NR). North Carolina (5-1) – Their resume is looking stronger each week. This team can really score. Their only loss was an ugly season opener to South Carolina by 4 points. 22 (22). Florida State (6-0) – I cannot buy into this team. They have some real players, but they can’t take over a game. They are the weakest of the unbeatens. 21 (NR). Pittsburgh (5-1) – Pitt has quietly moved up the rankings in the ACC. Their sole loss was against Iowa, which is looking more reasonable with each passing week. 20 (NR). Temple (6-0) – The only time the Owls have appeared to struggle with anyone this year was against Cincinnati. They have one of the most underrated defenses in the land. 19 (21). Houston (6-0) – Any other year, this would be the slam dunk Group of 5 choice. They are dominant in every way. Tom Herman is going to get a great job next year. 18 (23). Toledo (6-0) – Toledo continues to ride the momentum of beating Arkansas to just dismantle every team that steps in their way. 17 (25). Memphis (6-0) – The American Conference is the 4th best conference in America. Memphis appears to have one of the best offenses in the country, and their defense actually showed up in their whipping of Ole Miss as well. 16 (9). Florida (6-1) – The Gators performed admirably after Will Grier was suspended for a year due to PEDs. Losing in Death Valley is no shame, but their potential going forward looks a little bleak. 15 (6). Texas A&M (5-1) – They simply cannot win big SEC games at home. They rallied in the second half, but Alabama put them away by running the ball down their throat. 14 (3). Michigan (5-2) – There really are no words for their loss. They lead for the entire game...until the last play. 12 (15). Iowa (7-0) – Iowa exposed Northwestern on Saturday. Iowa hasn’t really played anyone, and they won’t play anyone. But they are undefeated. 11 (19). Oklahoma (5-1) – Their 55-0 win on the road in Manhattan just shows how much of a fluke losing to Texas was. They played angry, and they took it out on Bill Snyder’s overmatched squad. 10 (14). Notre Dame (6-1) – The Irish looked pretty good against an inspired and upset-minded USC team. They are just going to quietly move along with one-loss until they play Stanford. 9 (11). 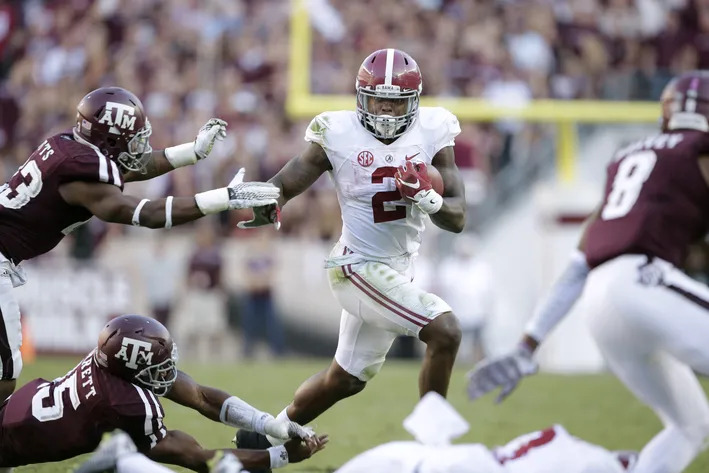 Alabama (6-1) – They had a mightily impressive win on the road. Their loss to Ole Miss seems less and less like a great loss. 8 (4). TCU (7-0) – TCU simply has no defense. You cannot give up points to Iowa State, especially not 21 in the first quarter. 7 (5). Clemson (6-0) – Clemson struggled a bit with Boston College, which is surprising considering how much they struggle to put any points on the board. They are still one of the best teams out there, and they are probably not going to lose in the regular season. 6 (12). Stanford (5-1) – They are maybe the best team playing right now. That offense has really gotten going. It is just hard to justify their loss to Northwestern given what we now know about both teams. 5 (10). Michigan State (7-0) – Yeah, they won with a lucky last play. They played way better than I thought they were going to, though. Connor Cook is a big game QB. 4 (6). LSU (6-0) – They won differently this week. Fournette did not exactly go off, but Brandon Harris played a strong game at quarterback and proved that this is the team to beat in the SEC. 3 (8). Ohio State (7-0) – The Buckeyes have finally figured it out. Cardale Jones is the starter, and JT Barrett is the red zone guy. They will not lose in the regular season if they keep that up. 2 (2). Utah (6-0) – I was impressed with Utah taking down a pesky, talented, and upset-minded Arizona State squad. They are going to be a force, but they are now the hunted. I would be surprised if they can get through conference play unscathed. 1 (1). Baylor (6-0) – They could drop 50 points on any defense. They can actually stop some people too…not well, but they aren’t giving up 40 points to anybody outside of maybe Oklahoma or TCU. They probably shouldn’t lose, but then again last year I thought the same thing before they got a 14 point loss on the road. This team just seems different. 5. Western Kentucky at LSU (#4), 4:00PM ESPNU – You know it is a weak slate of games when I am looking for a potentially closer than expected game. WKU can score, and those midseason non-conference mid major games for SEC teams don’t always go as planned. 4. Washington State at Arizona, 1:00PM TBD – The Cougars have been great since getting beat by Portland State to start the year. Arizona has been struggling. This could be a great game, and Gameday said that they will likely be in Pullman on Halloween night if WSU gets past the Cats. 3. California (#23) at UCLA, THU 6:00PM ESPN – UCLA is still one of the most talented teams out there. They have never been a traditionally good home team. California had a week off after the heartbreaker in Salt Lake. I like this matchup. 2. Utah (#2) at USC, 4:30PM FOX – I am not sure what else could go wrong for USC. Utah rolls into town, not having exactly been most impressive in recent weeks. Upset? 1. Texas A&M (#15) at Mississippi (#25), 4:00PM ESPN – The only matchup of ranked teams has a couple teams coming off tough losses. Ole Miss at home is tough to beat, but A&M can travel. 5. Dalvin Cook, RB, Florida State – He is the best player on the team, maybe the best player in the ACC. He is single-handedly keeping the team unbeaten when they are not asking the QB to do much of anything. 4. Trevone Boykin, QB, TCU – He might not be having the statistical year he had a year ago, but he is still dominant and scoring touchdowns at will. 3. Christian McCaffrey, RB, Stanford – He is setting all-purpose records in Palo Alto. His emergence alone has ensured that Stanford will no longer struggle to score. He is a gamebreaker. 2. Corey Coleman, WR, Baylor – He is being put in the same sentence as two-time Biletnikoff winners Justin Blackmon and Michael Crabtree. His first half season has been absolutely unreal. 1. Leonard Fournette, RB, LSU – He is the best player in the country. The entire defense keys on him, and he still drops 125. He is unstoppable. Only an injury will prevent him from taking the trophy. This summer, Amy Schumer went from having a cult following in the comedy world to being a household name after the debut of her movie Trainwreck. It is always great to see a hard working comedic talent finally get their due, especially considering it means we can see people like Amy Schumer (or Louis CK or Sarah Silverman) host Saturday Night Live. Although the episode was fairly average overall, Schumer brought an energy that will definitely warrant an encore hosting gig. One of my favorite sketches this current cast pulls out is their "Fox & Friends" parody. This is because they make this so ridiculous and so cartoonish to shed light on just how crazy some of these TV personalities can sound. The best part of each of these sketches is the list of errors. It is worth pausing or slowing down so you can read them all. I have always said the best monologues come from those used to giving monologues. The writers are able to take the night off for this one particular segment as the host can just work through some of their standard material. When that material has unique style of someone like Amy Schumer, it truly becomes a highlight of the night. This is now officially the best part of every episode. Jost and Che are on a great roll as their unique chemistry produces memorable joke after memorable joke. Their debate about guns to open Update was something they hadn't done before, but something they should continue to do. The more they are able to play off each other like that, the better it all gets. I used to watch Update to see which characters would pop up as the guests. Now I get disappointed when the guests appear because it interrupts the momentum the hosts had going. This Update brought about a new guest in Update researcher Solomon, who was okay, and repeat guest Mrs. Santini, who is getting more and more ridiculous. I am glad they only had two this time though, so we could see more from Colin and Michael. On another note, I hope the "Weeknd Update" becomes a regular occurrence. For as good as these pieces of the episode were, the regular sketches were a little bland. The best of them was probably this sketch about an over-zealous flight attendant crew that forgot one little detail upon take off. Amy Schumer and Vanessa Bayer have great chemistry together as is shown here. Amy Schumer's brand of comedy lives in the awkward and controversial. When you live in this realm, some lines work and some don't. This one, although not terrible, really didn't hit. An over-zealous actor adlibs and butchers a Lincoln reenactment. It teetered on the edge of irreverent and unnecessary, which is probably right where Schumer wanted it. This sketch was definitely awkward, but what made it work was the fact that everyone knows a person like this. A baby shower gets interrupted by the uninvited guest that takes a simple mistake as a personal attack. Again, Amy Schumer loves to live in the awkward, and this is a sketch that worked much more than the last one. It was about time Amy Schumer got a chance to host. Although it didn't go as well as it could have, it definitely showed why she has finally worked her way up the ranks. She is unique, controversial, and hilarious. I compare her hosting gig a lot to when Louis CK hosted for the first time. It was a little rough, but there was potential. Her brand of comedy certainly brought a breath of fresh air to the episode that is worth bringing back at some point in the near future. Last season, I lost track of my reviews and missed keeping everyone updated on the entire second half of the 40th season of Saturday Night Live. This doesn't mean there wasn't any quality. The show really started to find its new groove with the new cast as several started to emerge as potential new stars. I am hoping to get this new 41st season off to a good start with my reviews. This will be especially good after seeing just how good this season started. What was the biggest story of the summer? There is only one name that comes to mind: Trump. There was only one direction to go with the first sketch of the new season. Taran Killam dawns the orange rug now, taking the reins from Darrell Hammond. He may not be as good as the former castmember now announcer at SNL, but he is pretty good nonetheless. With the show's top talent impersonating the biggest character in the upcoming presidential race, we could be in store for quite the memorable set of political sketches ahead. This also marked the first of many times Killam and Cecily Strong were paired together this episode. They have the potential of being SNL's new power couple a la Jimmy and Tina or Seth and Amy. Miley Cyrus has been quite the popular host throughout the years. No matter how crazy she has been, she always seems to put on a good show at 30 Rock. Her ridiculousness may have gotten a little out of hand, as Miley came out for her monologue dressed in a dress of flowers. Once you get over the crazy get-up, you hear a song complete with a "15 minutes of fame" summer headline montage. It actually turned out to be quite the perfect start to the show as it highlighted the host as well as everything the show wishes it could have commented on over the summer if it had been writing live shows. The Weekend Update team of Jost and Che developed into quite the formidable tandem by the end of last season. It is now the highlight of every show as it was in the days of Fallon and Fey. Of the three guests at the Update desk this episode, two of the worked and one didn't. The first one was the dud, as Kyle Mooney brought the Pope to the desk to talk about his recent visit to the USA. It was made up for with Pete Davidson and Leslie Jones stopping by to give their unique perspectives. I could listen to them do this every week. Political figures love to make cameos on SNL during a political season push. This sketch was much more than a cameo, as Kate McKinnon brings her Hilary Clinton to life as she drowns her sorrows at the bar and commiserates with the local barkeep played by none other than Hilary Clinton herself. They discuss her political stances, as well as critiquing them at the same time. It was a sketch that could go down as one of those timeless pieces of political satire that Saturday Night Live has been known for creating. Stuff always seems to get weird after Weekend Update. Although some of them are pretty funny, this one was just weird. A group of girls are out to lunch, when they realize they are sitting at the diner and even the exact table that Meg Ryan filmed her famous scene from When Harry Met Sally... at. So they take turns reenacting the scene. Then comes Leslie Jones, who shouts to the heavens loads of gibberish that makes no sense but is supposed to be funny. Leslie is great in her routines, but is still working on perfecting her sketches. The one saving grace from this sketch is watching Vanessa Bayer make fun of the fact that she can't impersonate anyone as she tries (if you can call it that) to do a Billy Crystal impression. This was the first time Miley Cyrus had hosted in two seasons. The last time she hosted was only the second episode for Kyle Mooney, Beck Bennett, and a host of others. Kyle has become known for his quirky brand of comedy, and all that started with Miley's last hosting gig. This episode brought back that sketch as Kyle complains to his buddies about how into him Miley Cyrus is. They obviously don't see the problem. The first time around, no one really knew what to do with this sketch. Now that we know what Kyle is all about, it is always nice to see his sketches pop up at the end of episodes. It was also good to see the return of the sketch that started it all. No matter how crazy Miley Cyrus gets, she does know how to host the show. Lorne Michaels always seems to be able to take these media dumpster fires and showcase their talent in a way no one saw coming. I don't usually care for Miley Cyrus, but she could host SNL anytime. What a season of baseball! This was one of the most unpredictable seasons I can remember. Teams that were supposed to be irrelevant challenged for or made the postseason, and other teams floundered under high expectations. This has led to something baseball has been looking for: parody. More and more, every team has a shot at the postseason. This made for an exciting month of September, as six or seven teams were still competing for some spots in the playoffs. The best thing you can say about September baseball is it was able to stay relevant in the midst of the starts of college football and the NFL. Now that it is October, who will become this year's Royals? Who is best positioned to dominate like Madison Bumgarner did last year? (Easy answer ... no one...) Let's look at where everyone finished and how it compares with my preseason predictions. This division saw the Blue Jays end up on top for the first time since 1993. Mid-season trades for Troy Tulowitzki and David Price helped lead the stretch run and the best offense in the league. The main question entering the season for the Yankees was if their age would catch up to them, especially with Alex Rodriguez returning from his year suspension. They definitely answered that, sliding into the Wild Card slot in the most competitive race of the season. The Orioles struggled down the stretch and will need to actually have an active offseason to change their fate in 2016. Tampa Bay got off to a hot start and showed definite potential moving forward as the ultimate small market team. The Red Sox were a big disappointment this year. I predicted them as a Wild Card team before the season, but injuries as well as some free agent busts leaves one of the marquee franchises in the league in definite disarray moving forward. I was one of the few that saw the Royals finding a way to ride their postseason momentum from 2014 into a division championship in 2015. However, that's about all I got right. The Minnesota Twins were easily the biggest surprise in the league, as they went from consensus cellar-dwellers to almost winning a Wild Card berth. The Cleveland Indians were exactly what I thought they would be. They were good, but just not good enough to be much of a factor. They hung around the Wild Card race for awhile, but no one really thought they could make it. The bottom two teams were two of the biggest disappointments of the 2015 season. The White Sox made some offseason moves that seemed to position them for a successful season. It turned out to not be the case. Then there is the Tigers, who had won the division the last 4 years, but a series of injuries and slumps saw them hit the cellar and put manager Brad Ausmus on the list of "could be fired" managers heading into the offseason. I really messed this one up. After finishing the 2014 season with the worst record in the AL, the Texas Rangers rebound and win the division which no one saw coming, especially after an early season injury to ace Yu Darvish. I knew the Astros would be good this year, but I had no idea they would be this good. After a series of trades, they eventually slowed down and squeaked into the playoffs, but after years at the bottom of the AL, the youth movement in Houston is finally paying off and is only looking to get better moving forward. The Angels had a disappointing year. With the resurgence of Albert Pujols and with the best player in the league in Mike Trout, anything less than the playoffs would be a disappointment. Add to the a split in the organization that led to GM Jerry DiPoto walking away mid-season, and it was a bizarre year. With all that said, they entered the last weekend still with a shot at a Wild Card. The Mariners can go alongside the Tigers as the most disappointing teams in the league in 2015. After missing the playoffs by a game a year ago, expectations were high entering the season, with some wondering if they could be a World Series favorite. However, the M's proved to have the same struggles to score they always have which led to the Mariners finding a new GM by the end of the season. The one thing I got right was what I was the least sure about in the division. For the past few years, I always feel like, entering the season, the A's look sub-par. This is the first year I was actually right. Knowing them, they will be back to competitive soon. Where did the Mets come from?!? The young pitching in New York became breakout stars across the league as they carried their team to a surprising postseason berth. Of all the disappointments across the league, the Nationals have to be the worst. For a team that was set up before the season as "World Series or Bust," they didn't even make the playoffs. Entering the season, they had the best pitching staff and the best lineup in the National League. To not make the playoffs almost ensures that manager Matt Williams will not be leading the team in 2016. The Miami Marlins followed up a strong 2014 season with a disappointing dumpster fire in 2015 that led to their manager (unfairly) being fired mid-season and replaced by their GM that had never managed at any level before. Only the Marlins... For the first time since the 1980's, the Braves are in full re-build mode as they dropped low in the rankings as they replenish the farm system and work their way back to prominence. The biggest lock in all of baseball entering the season was that the Phillies would be the worst team in baseball. You can definitely say they didn't disappoint. I wanted to think that the time had come for the Cardinals to be dethroned atop the NL Central, but then I forgot that it's the Cardinals and their success always defies logic. Their rotation became the best in baseball, and they once again show they never miss on a prospect. That means the Pirates were once again the bridesmaid and will host their third straight Wild Card Game. The surprise here is the Chicago Cubs. I knew Joe Maddon would make them an improved team, but I didn't see them being playoff-bound in his first season. The emergence of Jake Arrieta as a star, as well as young sluggers in Kris Bryant and Kyle Schwarber, has the league buzzing with the idea that the Cubs might be a perennial contender to finally break their streak. The Brewers may have been the blandest team in baseball, as they had nothing to make them stand out in any way throughout the season. Then there is the Reds, who became the last team in the 4 major sports to finish in the cellar in their division since 1984. They still have talent on that roster that simply aging and under-performing. The biggest mystery might be why the Reds have already announce that Bryan Price will be back as their manager next season. The Dodgers needed to win this division for the same reason the Nationals needed to win theirs: they were just too good not to. Now we will see if they can actually cause some damage in the postseason. The Giants continue their streak of missing the playoffs on odd-numbered years, which means you are looking at the World Series favorite in 2016. The Diamondbacks had a surprising season led by the best player no one has heard of (still) in Paul Goldschmidt. Another great disappointment was the Padres. History tells us that trying to buy a team in one offseason almost never works so we should have seen this rough Padres season coming. Then there is the Rockies that had such a poor season, they were willing to part with their best player to try and build for the future. The Twins and the Cubs both went from the cellar to competing for a playoff spot, with very little changes made to their personnel outside of their manager. That is the definition of a Manager of the Year. 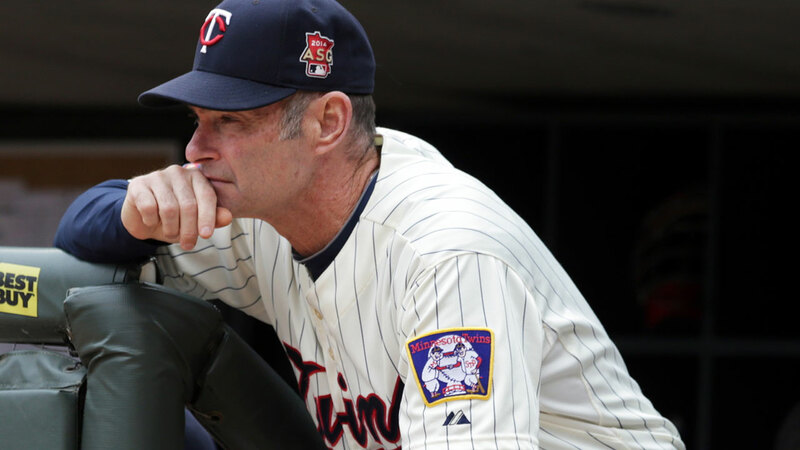 Molitor and Maddon became game-changers for their teams and were able to completely change the culture of the teams in just one season. Carlos Correa was able to successfully transfer his "phenom prospect" status into "emerging superstar." 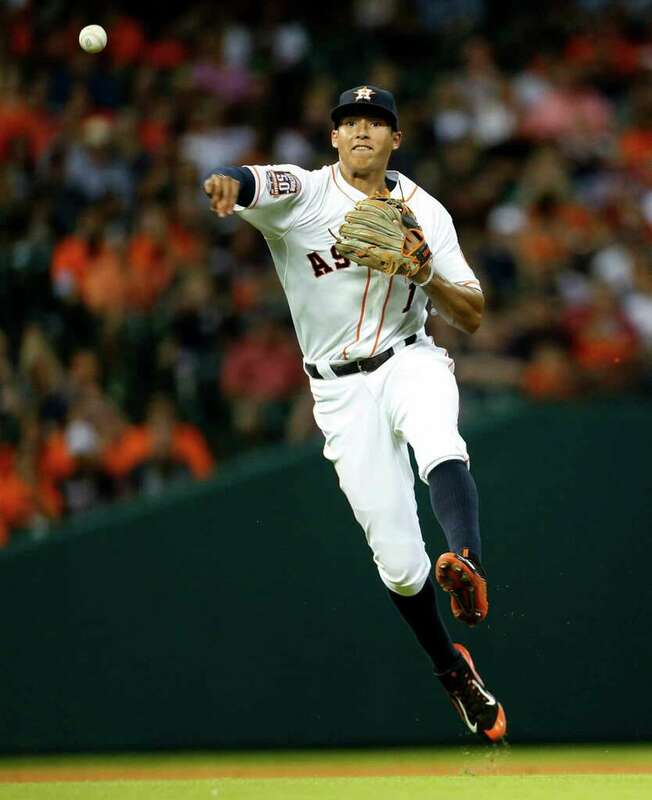 He quickly became one of the leaders on an Astros team heading to the playoffs. Devon Travis had an opportunity to be much higher on this list if he had been healthy all season. Miguel Sano quietly had a stellar season (quietly only because it happened in Minnesota). Burns and Canha, who are the epitome of "Moneyball" players, only reinforce my suspicions that the A's will be back sooner rather than later. This is one of the deepest rookie field I have ever seen. From Spring Training till now, Kris Bryant and his immense talent has been one of the best stories of 2015. He met all expectations and exceeded (which was thought to be impossible) them as he helped lead his team to the playoffs. Pederson had a dream first half, and although he struggled down the stretch, his numbers are undeniable. Jung Ho Kang entered the season as an unknown, and now he has single-handedly allowed the Pirates to once again use Josh Harrison as a super utility player. Noah Syndergaard joined Harvey and deGrom at the top of the best young pitching staff in baseball. Matt Duffy came out of nowhere to make the Giants quickly forget about fan favorite Pablo Sandoval. I said at the beginning of the season that Dallas Keuchel was the most important pitcher to the Astros' success. After putting up the numbers he did, no wonder the Astros are going to the playoffs. For the second time in a year, David Price changed teams. It isn't that he isn't wanted, but that other teams want him so much. He took a solid season for the Tigers and became the leader of the Blue Jays on this playoff push. King Felix did not have the numbers he usually does, but with that said, he came close to his career high in wins. This goes to prove that an average Felix is better than most pitchers' best seasons. Sonny Gray proved to be a budding ace in the A's rotation. Lastly, Chris Sale once again put up outstanding numbers on a bad team. The White Sox need to get good soon or else Sale will be taking his talents elsewhere much like Price has. Last year was all about Kershaw. Although his numbers are not what they were last year, he was still incredibly good. The first half of 2015 was all about Greinke. He put up ridiculous numbers and had an opportunity to set records. However, the second half of the season was all about Jake Arrieta. Everyone wanted to talk about Jon Lester to start the season for the Cubs, but Arrieta became the ace and is the best pitcher in baseball going into the postseason. Gerrit Cole emerged as the ace the Pirates needed. One of the few things on the Nationals that didn't disappoint this season was Max Scherzer. Two no hitters automatically puts you in the top five of this list in my book. Even though Josh Donaldson changed teams this offseason, his impact on his team did not. In an offense that already had Jose Bautista and Edwin Encarnacion and now also boasts Troy Tulowitzki, Donaldson has been their best player and one of the main reasons they find themselves in the playoffs. Mike Trout is the best player in baseball, and even though his team will not be in the playoffs, it isn't because of Trout. Nelson Cruz was one of the few bright spots for a struggling Mariner offense. For some time, Cruz was flirting with a Triple Crown. Prince Fielder came back from the injury that cost him most of his season in 2014 and became the main cog that led the Rangers back to the playoffs. Lorenzo Cain emerged as this year as the brightest star on the AL's best team. That alone garners a spot on this list. The Diamondbacks exceeded expectations this season, and Paul Goldschmidt is one of the main reasons why. He is possibly the best pure all-around hitter in all of baseball. Bryce Harper put up ridiculous numbers, but where Goldschmidt led his team to over-achieving, Harper's team vastly under-achieved. Although his numbers were great, he needed to lead his team to the playoffs to win MVP for me. Nolan Arenado was on one of the worst teams in baseball, but when it comes to the Rockies, it is never because they can't hit. Arenado will continue to develop into one of the best players in all of baseball. Kris Bryant went from top prospect to MVP candidate. Andrew McCutchen, along with Trout, is one of the best all-around players in baseball. By the way, it shows just how much success in the NL is determined by pitching when the top three MVP candidates are not on playoff teams. The AL Wild Card Game features two surprises for two different reasons. The Astros weren't supposed to be this good this soon, and the Yankees weren't supposed to be this good this old. So which Cinderella will make it to the next round? I think Dallas Keuchel has been too good, and the Yankees have really limped their way into the playoffs. I expect the Astros to walk out of the Big Apple with a big win. The Pirates have gotten used to being here. This is their third straight Wild Card Game they have hosted. They won the first one, then got MadBum'ed (along with the rest of the league) last year. They are ready to take the next step. The Cubs are the team everyone is talking about as they try to reverse history. Arrieta has never faced the bright lights of the postseason before, along with most of the Cubs' key players. The Cubs might possibly get there with this current core, but not this year. It's the Pirates who are ready for the next level. The Rangers might be the biggest surprise of this postseason. Not only were they not supposed to be this good, but they were nowhere close to this level halfway through the season. They traded for Cole Hamels telling him, "Don't worry, we'll be good next year." Then they won the division. As good of a story as it is, the Blue Jays are a better team and a better story. They will have the fire and momentum that the Royals had last year on their unlikely run through the playoffs. As for the actual Royals, many predicted a World Series hangover after their miracle run last year. but instead they worked their way to the best record in the AL. They sputtered their way through September, but I think this was mainly because they saw the postseason coming. If they showed anything last year, they know what it takes to win in the playoffs. Again, they were a MadBum away from a World Series ring. They also have one of the best home field advantages in all of baseball. They will take care of the Astros. The Dodgers and Mets is an intriguing series. The Dodgers are trying once again to take the next step and show they can be a serious contender in the playoffs. On the other hand, the Mets are loaded with young talent that has jump started a fan base. As good as the Mets' young pitchers are, I think they are too concerned with keeping them healthy to win this year (sounds a little like the Nationals a few years ago ... we all saw how that went...). The Dodgers are hungry for a win. Kershaw and Greinke have been two of the best pitchers in the league, but they have yet to show it in the postseason. They are also more than just the veteran core they have featured recently. Rookies like Joc Pederson and Corey Seager will bring a spark and enthusiasm. Something about this team feels different than past years. This next series is the toughest to pick. The Cardinals are really hard to beat in the postseason. Their pitching is some of the best in the league, and their lineup seems to constantly get the job done no matter who is in it. With all that said, if any team is built to beat them, it's the Pirates. They are already division rivals so they know each other well. The Pirates can hit, they can pitch, and they are not intimidated by the Cards. The X factor in this series will be the health of Yadier Molina. If he is healthy enough to play his game at the elite level only Yadier can, then the Cardinals will probably win. I don't think he will. If this is the ALCS, it might be the loudest and most exciting playoff series of all time. These are two of the most passionate fan bases in the league, and they are both starving for greatness from their teams. They are very similar teams with strong offenses and possible weaknesses in the starting rotation. Last year, the Royals showed they can hit against anyone in the playoffs (not named Madison Bumgarner), and they gained invaluable experience almost no one on the Blue Jays roster has. Their experience, along with home field advantage and the best bullpen in baseball (even without Greg Holland) will lead the Royals back the World Series. If the Dodgers break through and win one series, they should ride that confidence to the World Series. They don't get here without Kershaw and Greinke being on top of their games, and if they are, they can handle the Pirates lineup. I love the Pirates and would love to see them take another step, but I just don't see that happening. I ended up with the same World Series matchup that I had before the season, so I might as well go with the same prediction for the result. No one thought the Royals could make the playoffs last year. Then they were a batter away from winning it all. No one thought they could bounce back and make the playoffs again this year. They ended up with the best record in the AL. No one thinks their team is playing well enough to make any noise in the playoffs now. So I am picking them to win it all. There is something about this team that never gives up. They will ride this to the title they probably should have won last year. Royals in 6, with Alex Gordon winning World Series MVP. Bring on the Fall Classic!!! College football is officially bananas. I am going to rip up my previous top 25 polls and start over each week. There is no reason to have preconceived notions about any team. I mean, Ole Miss got spanked by Florida, who could barely take care of East Carolina. Ohio State looks pretty awful every week, yet I still have them #1 for some reason. Michigan State can’t put away freaking Purdue. LSU seemed totally content letting Eastern Michigan put up 20+ points. I’m done with the past. I’m starting fresh. 25 (NR). Memphis (5-0) – The Tigers have one of the top offenses in the nation. We will see how true that statement is when they host Ole Miss after their bye next week. 24 (NR). California (5-0) – They struggled with both Washington schools, but they have survived. They are an offense that no one really wants to deal with in the Pac-12. 23 (7). 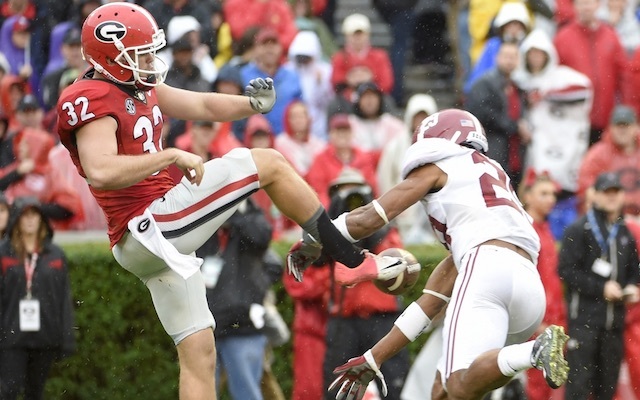 Georgia (4-1) – They got humbled by Alabama at home with all the hype and even gave points in Vegas. Mark Richt will never win the big one. 22 (22). Florida State (4-0) – They still have not lost a game in the ACC since NC State upended the unbeaten Seminoles in 2012. It is a weak conference, but still. They just keep winning. 21 (NR). Mississippi (4-1) – I accidentally left them off last week, so that is how you can get shellacked and move into my top 25. It seemed fluky watching them get dismantled by the Gators, but it was emphatic. 20 (19). Boise State (4-1) – This is a team that will probably not lose the rest of the season. Their loss at BYU seems more and more confusing. 19 (18). Oklahoma State (5-0) – They survived a scare from the well-coached Kansas State squad looking for the upset. No one really knows what to make of this team. 18 (NR). Iowa (5-0) – The Hawkeyes were able to get out of Madison with a win…you can’t say that about many teams in the last decade. It was ugly, but that is how they win. 17 (6). UCLA (4-1) – The Bruins came in thinking of national titles after crushing Arizona on the road under the lights, but then the favor was returned by the seemingly dead in the water Sun Devils. 16 (11). USC (3-1) – IDLE. 15 (2). 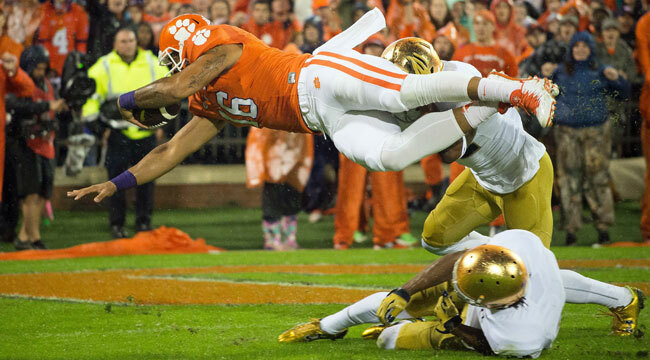 Notre Dame (4-1) – Their wins do not have the same luster they seemed to previously, but they had a nice comeback attempt against a really good Clemson team. 14 (9). Oklahoma (4-0) – At some point, the defense for the Sooners has got to start playing. West Virginia looked lost, which is rare for them. They were lucky to have such a big win because they really didn’t play all that well overall. 13 (14). Alabama (4-1) – Yes, they stomped all over Georgia, but their loss to Ole Miss loses some of its prestige seeing the Rebels get kicked around by Florida. 12 (10). Stanford (4-1) – This team might be playing at the highest level of any team in the country at this moment. They are going to be right there in the thick of the playoff hunt when all of the teams get a loss (and they all will). 11 (12). Northwestern (5-0) – They are going to be the ones helping Stanford get there if they can keep shutting teams out and winning in that beautiful Big Ten West way. 10 (16). Baylor (4-0) – They simply cannot be held under 8 touchdowns. They are going to terrify every team they line up against. 9 (NR). 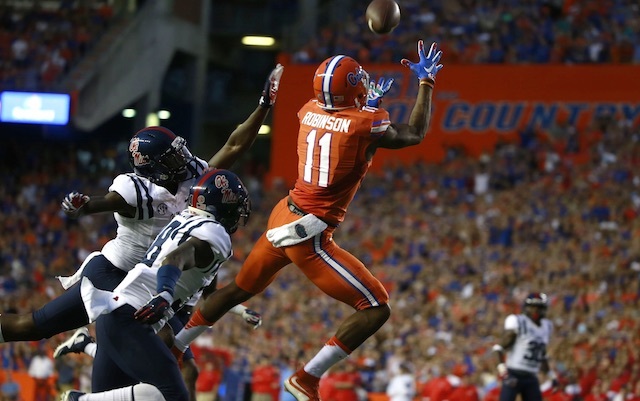 Florida (5-0) – I am still stunned by the beating they put on the Rebels on Saturday. They aren’t that good, are they? Maybe they are? 8 (1). Ohio State (5-0) – They have flashes of being the team that was the obvious national championship pick, but they just can’t get off to a good start. They will lose one very soon. 7 (24). Michigan (4-1) – After a second straight shutout, it seems clear that Harbaugh has the team right back where it was before Hoke. They might win the conference. 6 (21). Clemson (4-0) – After a couple underwhelming efforts, Clemson proved that they can really play well against elite competition (unless that team is South Carolina). 5 (5). Michigan State (5-0) – You just can’t let Purdue score 21 points in a row in the second half and expect to be able to beat legitimate Power 5 conference teams. They will lose one soon. 4 (8). LSU (4-0) – The Tigers looked pretty bad against Eastern Michigan. If they didn’t have a horse at running back, they would look very ordinary. But they do have him, and he alone makes them maybe the team to beat in the country. 3 (13). Texas A&M (5-0) – You would be hard pressed to find a team that has looked more impressive on paper and on the field than the Aggies. They are incredibly exciting to watch too. 2 (3). Utah (4-0) – IDLE. 1 (4). TCU (5-0) – Oh, Texas hahaha… The Frogs got life from that miracle win last week, and they are going to charge toward a playoff berth the rest of the way. 5. Navy at Notre Dame (#15) – This is always a good game, and Keenan Reynolds is going for the FBS rushing TD record and is still unbeaten. It should be quite a show. 4. Florida (#9) at Missouri – Missouri is not an easy place to play, and Florida is coming off their biggest win in years. This is a sneaky good game here. 2. California (#24) at Utah (#2) – Utah got a week off to prepare for the high paced Golden Bear attack, but that might slow their momentum as well. It is almost impossible to win in Salt Lake, though. 1. Northwestern (#11) at Michigan (#7) – This is going to be an ugly game offensively, but it is going to be a beautiful football game featuring two teams who have multiple shutouts through five games. 5. Nick Chubb, RB, Georgia – The loss hurt his team’s chances, but he extended his all time Georgia-best streak of 100 yard games. He is one of the elite players and will be invited if he keeps it up. 4. Ezekiel Elliott, RB, Ohio State – If they have finally figured out that all they need to do is hand the ball to the beast, then he will be in this discussion by season’s end. 3. Baker Mayfield, QB, Oklahoma – He is more of a dark horse contender, but he really is rolling in that air raid offense in Norman. 2. Trevone Boykin, QB, TCU – He is already setting records at TCU, and his numbers this year are only going to get better the deeper he gets into Big 12 play. 1. Leonard Fournette, RB, LSU – Unless he gets injured or completely shut down by someone, he is going to run away with this thing. Thoughts? Comments? Your top 4? Let me know below.